Oh! Oh! I'm editing this to include the link I meant to include when I first posted it...DUH! 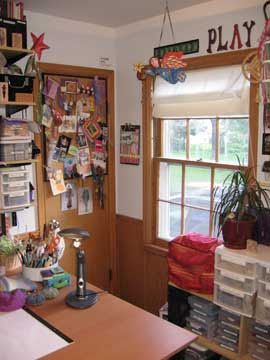 A Room of One's Own (which lots of photos inside Sherri's Studio) at CrafterNews (by Crown Publishing). And were it not for her true confessions I might not have believed Sherri Haab either, with her clean white walls and simple trappings. 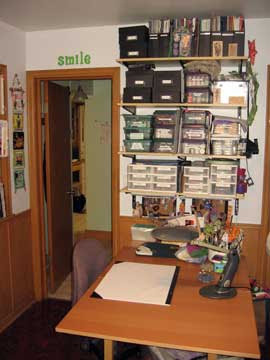 But, I was convinced her studio is not a figment of my hopeful imagination or new set for a cable craft show when she talked about "studio creep" -- that thing that happens when your projects take over the rest of the house -- and being fueled by chocolate late at night. Dingbat fonts -- those wonderful typefaces made up of various themed symbols -- make my world go 'round. I love them as potent little terrariums of creativity. They take up so little space on the computer, but then WOW! you unlock them in Word or PowerPoint or your favorite image editing program, and out roll unlimited possibilities. They are scalable of course, either as you resize them in your type program, or subject them to whatever your image program can do, and colorable in so many ways. I used to visit dafont.com in search of pretty black and white dingbat fonts whose characters I could transfer onto polymer clay, and then color with pencils before baking. Lately I've been using Mail Art and postage themed fonts, which I play with, and then print onto vellum paper and transparencies for use in collage. The little graphic above represents only a smidgeon of what's available in MailArt Graphics by K-Type, which contains an unusually abundant number of characters. There are other rubber stamp fonts around but I like this one because it's not obviously doctored to be grungy but still has a hint of poor spacing. Plus I love small caps. 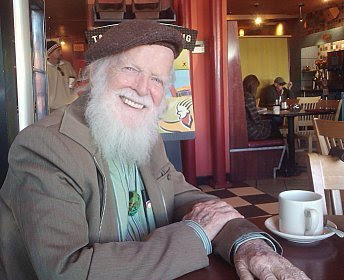 On Satuday I interviewed artist and art therapist Howard McConeghey for a paper I'm writing. What a pleasure! I realized later it was almost 30 years ago that I took an Intro. to Art Therapy class with him. Oy! Howard will turn 90 years old in a couple of months, and he invited me to his birthday party! Here's a photo from our interview spot, in a little window berth at Flying Star on Central Ave.
Carol Strand-Siebers, the Sassy Art Goddess, has photos of her studio -- a converted bedroom looks like -- on her website, and on the one hand she gives me hope and on the other I want to swap bodies, or at least studios with her. Sometimes I see people's studios in photos and I think to myself "Yeah, but you don't have the STUFF I've got." I can see that Carol's got the stuff and even probably a smaller room than me, and she's done it! 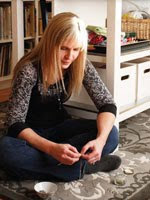 Check out her studio photos here: http://www.sassyartgoddess.com/my_studio.htm. 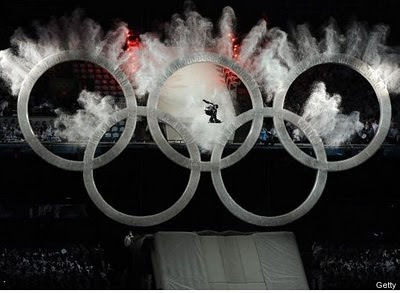 Am I the only person who thought that techno show after the athletes walked in was the strangest thing they'd ever seen? Technologically adept, certainly, but odd, disjointed, and considering the amount of white people wore (yes, we know it was about snow), not very internationally appropriate (white is the color of death in many other places). Sarah had to work last night so she Tivo'd the show -- she just texted me "Huh? Ice Totems?" Yeah. Which brings me to the other part. I loved watching (and hearing, when I could) the pow-wow dancers but some of that other indigenous stuff struck me as more than a tad exploitive. Maybe it's just me. I guess if I want to see a tour de force of Western entertainment technology, I'll go see Avatar. The Olympics comes once in awhile and I thought the opening ceremonies were supposed to honor the possibility of coming together in the world. Watching the athletes come in was the best part. The rest of the show was just a very, very expensive mess.